About twenty years ago, I discovered a recipe for Pumpkin Chiffon Pie written in my Grammy's handwriting and made it as part of a homemaking class on recipes using pumpkin (I also taught how to make your own pumpkin pie filling from fresh pumpkins). It was a lighter and fluffier recipe than any pumpkin pie I'd tasted before, seeming quite chic and sophisticated. It wasn't until today that I discovered the possible source of that recipe. As I thumbed through a well-used copy of "Aunt Chick's Pies" by Netti Pendleton McBirney (1940), I found some clues. In the index, I found penciled checkmarks next to only three recipes--one was for Pumpkin Chiffon Pie. I also found my Grammy's handwriting in the margins of page 4 of the pamphlet (as well as speckles of white flour from her kitchen stuck to page 3, still white and looking very flour-like). What I'm finding wonderful about this fairly succinct recipe pamphlet is the breadth of knowledge it contains. It covers all the basics about pie crusts but also covers the basics of tarts, fried pies, filled cookies, doughnuts, ravioli, sweet dessert pies and savory meal-in-a-crust pies. If you want a traditional recipe for Christmas mincemeat pie, it's in here. If you want the recipe for "Southern Sweet Potato Pie", it's got that too. 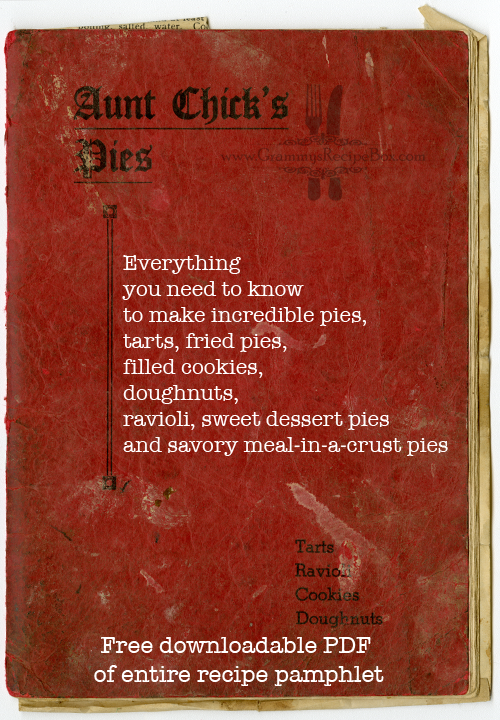 There's a whole section covering just custard pies (that's where you'll find a recipe for "Peanut Butter Pie"). 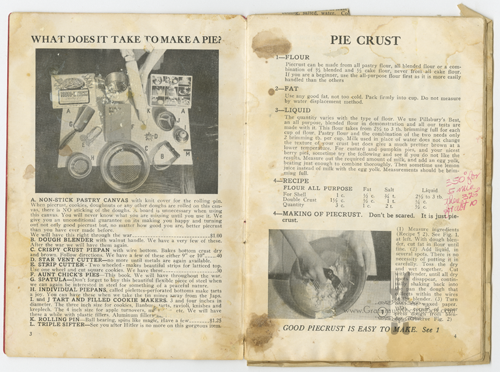 In addition to a list of all the necessary tools you need to make pies from scratch (see photo below), there are specific instructions on caring for a non-stick pastry canvas just like I watched my mom use for years (keep in mind this was written in 1940 and my copy is a reprint from 1944 so there is at least one racially insensitive statement about Japan in this section). "Metals are gone so I can no longer sell you a blender. However one of these days this fight is going to be over. In the meantime if you have no blender use the recipe for Hot Water Piecrust given below. It is just as good a piecrust. It has a slightly greasy feeling as you handle it which I do not like especially but the results are worth working for. 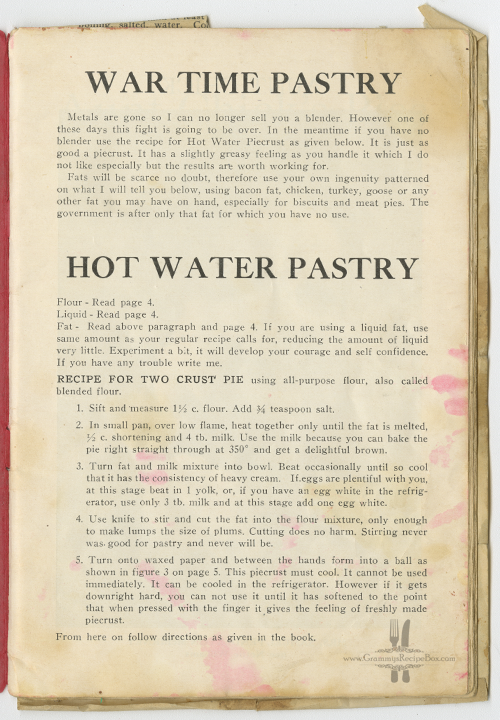 "Fats will be scarce no doubt, therefore use your own ingenuity patterned on what I will tell you below, using bacon fat, chicken, turkey, goose, or any other fat you may have on hand, especially for biscuits and meat pies. The government is after only that fat for which you have no use." Just from the excerpt above, I'm thinking many of the recipes could be adapted for survivalist conditions, off-the-grid cooking, or outdoor camp-kitchen conditions (possibly even a dutch oven). Let me know if any of you test any of the recipes in any of those ways. I'd love to know if my hunch is right.